Pacing back and forth, nervous anticipation exuding form every stoma of my being. Why I’m nervous, I have no idea. I’m simply waiting for the most amazing woman in my life to arrive. The one person who manages to put a smile on my face at any time or in any circumstance. Here I am in the baggage claim of Denver International Airport, just pacing, back and forth. I can just imagine the scene in the security office. Boss, check out camera 10, this guy is all over the place. maybe we better get the SWAT team ready! A short time later, that felt like an eternity, I look up the hall and see a vision of beauty. She is running down the hall toward me… Running, in high heels and a lacey black dress. I start to move towards her, a huge smile on my face. The scene could have easily come from some silly commercial or one of those girly romance movies. Two people running towards one another, embracing and kissing each other with obvious passion. It has been five weeks since I last held her gorgeous form in my arms, and I simply can’t resist. especially since this little vacation very nearly didn’t happen. We had planned everything out for the last three months, yet finding a load to get me to Colorado turned out to be impossible. I ended up bobtailing, driving without a trailer or load, from Sapulpa, Ok. to Denver. The company was not too happy about it either, but I won out in the end. My sister Chris’ Husband, Carl, had picked me up from the truck stop. Given me a ride to the airport to pick her up, and drive us back to the truck. We would spend a little time with them when the weekend was over. Our priority on this night was to get ourselves in my truck and up to Fairplay. Traffic in Denver was surprisingly heavy at 9:00 PM and it took a little bit to leave the the city lights far behind us. I weaved my way through the mountain valleys, going up, up, and up. We stopped on top of Kenosha Pass at about 11:00 Pm. The night sky was clear, black as velvet and sparked with the glimmer of stars. I had nearly forgotten how beautiful the night skies are up here. I inhaled the purity of mountain air, and felt a rejuvenation starting deep inside my spirit. Before knew it, I was parking at Mom’s house, and getting ready for bed. I’ll keep the details of that to myself, thank you very much. Saturday morning, we woke early, eager to start our day. Breakfast at Mom’s, and then we had a few scheduled events for the day. The reason behind this little vacation was my 30 year high school reunion. There was a meet and greet at the local coffee shop, The Java Moose. Then we spent the day exploring the Burro Days booths (Local Annual Event) and South Park City (Restored 1880’s Town). Jennifer and I spent the whole day together, with nothing to do. It was probably one of the first times ever for us. We spent the evening with Mom and Kevin, (my brother) and then got ready for the barbeque at Cohen Park. To put this reunion into perspective, you have to realize that a successful reunion has an attendance of only 15 percent of the class. When your graduating class is like mine, 28 people, you have to open things up to other classes also or there would only be 2 or 3 people. So the entire decade of the 80’s was invited. we had about 20 people show up. It was pretty neat to see all the people I grew up with and went to school with so long ago. Many of us “friended” each other on Facebook and made other connection to stay in contact in the future. Although the “purpose” of the vacation was the reunion, the best part was spending so much time with Jennifer. Sunday, we set out to see my old stomping grounds. Jennifer and I have a history up here, and it started with the Buckskin Cemetery in Alma. Naturally we had to return there and explore the tombstones. The interesting part about old cemeteries are the ages of their residents. It’s always shocking to me to find so many children. I know it was a difficult time, and the medical services were simply not available, yet it still saddens me to see it. The Grave markers themselves are of interest also. We found this wooden marker among the aspens, surrounded by a weather worn and dilapidated wooden fence. A five year old little girl. I wonder at the cause of her death. Was it an accident, disease, or something more traumatic. The solemnity of cemeteries is conducive to thought and contemplation. I always feel as if I’m communing with the spirits of those who went before. Now I’m not a religious person in the slightest, yet I do believe people have an energy or spirit. Sometimes those spirits don’t chose to leave, preferring to stay behind and share with the living. After the cemetery, we went on up the mountain, exploring the back roads and mountains. we spent nearly the whole day on the mountain, enjoying breathtaking views and clear fresh mountain air. For me, best of all, I was able to spend all day with Jennifer. Like I said she is able to put a smile on my face at any time, but especially when we’re together. I’ll share more in the future, but for now, This seems to be a decent place to pause. All within a short hike. Small effort is required for civility. Just a quick stroll away from urbanity. Never too distant, forever in view. Rewards are vibrant, colorful, clamorous and few. There are times, I feel the need to center myself, find my spirit, discover my vision, and see my dreams. the best, however seldom easiest method for me, is to take a short stroll in natures edification. Far from the hustle and bustle, leaving the uproarious highways and byways behind. The trick is to seek out the silence, absorb it, take it all in, until my senses become clamorous with the sounds of nature. A brisk walk along a grassy, or in these days, snowy hill. Light mists hanging low, encompassing the surrounding hills, almost like natures own noise dampening buffer. I can stop, stand still, smell the fragrances abundantly flavorful. Then I simply close my eyes, take a deep breath, relaxing all the stresses and strains of life. When I can hear the wind whispering in the trees, gently bustling the grass, a babbling creek somewhere off in the distance. Perhaps a simple birdsong, chirping not too far away. I open my eyes and find myself surrounded by a remarkable visions of beauty. All for seeking The Sound of Silence. A Word Press Weekly Writing Challenge. There are multiple ways of interacting with silence: purposefully leaving something unsaid, breaking the silence around a topic, or, quite simply, getting tongue-tied. For this week’s challenge, we want you to take the theme of silence and explore it in your own way. There are times when I wonder where I get my wandering spirit. I believe I can credit that to my Father with reasonable accuracy. After all, he is probably responsible for everything good about me. When I was just a wee little one, my siblings, two sisters and a brother, and I went everywhere with Dad. Mother had a job at the local hospital, and we couldn’t spend a whole lot of time there. Although there were times we got to terrorize the staff, patients, and residents of the senior living, but that is a story for another day. Dad always seemed to have a jobs he could take us along, I’m sure he planned it that way. For many years, basically as far back as I can remember, he was a surveyor. There were many old ranches that had sold to land developers. Naturally, They just had to subdivide, lay out roads, and establish property lines. It was his job to go out to these vast rangelands, layout, mark, map roads and establish lot lines. All four of us got to go along, just about everyday, especially in the summer. They were grand adventures for my young mind, and we had a certain level of freedom unlike kids these days. It was a different time, and much smaller communities than today. Dad always started out early. After packing a large enough lunch for all of us, he would load us up in Shasta and roll out. Now Shasta was an interesting old pick up truck. It certainly wasn’t his first, but she was his first brand new truck. In 1972 the company he worked for bought three new Chevy Blazers, so Dad ordered his truck also, to take advantage of the “Fleet Price”. It was a 1972 Chevy Half Ton, four wheel drive and was the ugliest yellow anyone had ever seen, company colors. He paid a whopping $12,320.00 for her, and let me tell you, Dad made that old girl last. He named her Shasta, because “She has to have gas, she has to have oil, she has to have water”, and a whole plethora of “She has to have’s” us kids came up with. I have some very fond memories of riding in that old truck. The AM radio tuned scratchily, to the only station that was available. Dad’s grin when tunes like “Sneaky Snake”, “Gitarzan”, “The Streak” and so on would come on. Of course all of us would sing along as best we could, adding to Dad’s expanding grin. We always knew it was lunch time when Paul Harvey would come on with “The Rest of The Story”. We would get out to these far ranging ranches early in the morning. Being as Kel and Chris were the elder children, they got the pleasure of carting Dad’s equipment around. Holding reflecting staffs and such so Dad could shoot his distances and elevations with the transit. While Todd and I explored, ranging far and wide, NEVER out of hearing distance of Dad’s voice. You would be surprised just how far away one can get and still be in hearing distance of Dad’s resounding holler. So while the girls worked, the boys wandered, rambled, built forts, hunt for arrowheads, went fishing with whatever we could find, and basically did nothing. We fancied ourselves explorers of uncharted territory. Fighting off wild Indians, criminals of temperamental ilk, and vicious animals. We always saw new country, and some of the most beautiful mountain lands ever. When lunch time rolled around, Dad would yell for us boys, and we would amble back to the truck. He’d hand out sandwiches and the ever present fruit cocktail. The ones that came in a little can you had to open with a P-38 or pocket knife. It never seemed to fail, but Dad almost always forgot to pack spoons. Not a problem for a man his his resourcefulness. He simple grabbed a piece of survey lathe and carved five spoons with his trusty, never dull pocket knife. We would sit, eat, and talk about the day. What had to be done in the afternoon, and always what trouble Todd and I had been getting into. Each subdivision had a unique theme or name like Indian Mountain, The Buffalo, Ranch of The Rockies. Of course all the roads within had to have names that suited the theme. Indian Mountain had roads like Teepee Trail, Arrowhead Lane, Papoose Court, and so on. The surveyors got to name the roads, and quite often we would help. So there are roads up there named Gitchie Goonie Lane, and other completely off the wall titles. I have no idea how they fit into any of the themes. If I remember correctly that was in Valley of The Sun, or South Park Meadows. Dad told me many years later that he quit surveying, when one day he stopped on top of Wilkerson Pass and looked out over South Park. He saw the myriad of roads cut into the landscape with not a single house built. He said that, that moment for him was the most disappointing realization in his life. He said that he was ashamed of what he had been a part of. He had seen all of the county long before there were any roads, and then felt responsible for destroying that beauty. I suppose, my wandering nature, my gypsy spirit, is bread of those fun and memorable times. There had certainly been a lot of rambling around, and a little wanderlust, even if on a much smaller scale. Today, may have been the first time I have ever driven I-8 Through Arizona in the daylight. I have been across here numerous times at night. This morning though, was the first time I saw the dragons sleeping and wondered what they were dreaming. South Western Arizona, is one of those areas that is very mystical, especially at night with a full moon. During the daytime though, it’s a slightly different story. I was surprised to find myself appreciating the simplicity of the area. I want to say beauty, but I’m sorry, that word just doesn’t fit here. There is a grace and elegance to the terrain, along with a bit of ruggedness, and lots of barrenness. The sky is wide open, and today was as blue as can be with lacy, net like, clouds reflecting the suns rays. Probably what stands out to me the most, is the colors. So very subdued and earthy, yet strangely vibrant and different in their own way. I’m sure, no one is surprised when I say the geological features I appreciate the most, are… You guessed it, The mountains, if you can call them that, I would say hills. They are a sign of significant upheaval, either volcanically or seismically, probably both. I’m going to lean towards volcanic, simply because of the stone and rock in the area have a lava or malpais appearance. They are a very rugged looking bunch of hills. I jokingly thought of them as razor back, or saw tooth ridges, similar to the dinosaurs spines. Suddenly, I realized what they made me think of. If you look at them closely, you can see they are simply a family of sleeping dragons. There are several hills in one area, that each have a body, tail, neck, and head. Positioned in all different directions and poses. On a night with a full blood moon, or like last week, a Wolf Moon, these sleeping dragons are really impressive. Especially when the moon is rising or setting behind them, distinctly outlining the ragged nature of their ridges. Of course for the most astounding views, they must be view on the blackest of all nights, with a calamitous lightening storm illuminating the dragon’s backs. One final climb over a slight ridgeback, and I dropped down into Yuma Arizona. We run a lot of loads out of here, cauliflower, lettuce, broccoli, cabbage. Today though, I’m just passing through. Headed on into Escondido, Ca. From there who knows… But I certainly hope it’s towards Salt Lake City. I need to get this truck turned in, and move on with my life. I am still very disappointed with the outcome of the past three plus years, job wise that is. Pleasant roads all, I’ll catch you on the flip side. While Shimmering Grains was Walking in Winter Wonderland, I was driving in one. However, her photography is far superior to mine! I started my day before dawns early light, from Spokane, Wa. Heading east, I came to 4th of July Pass first, concerned because I had heard rumors about the chain law being in effect. However, made it over without having to chain up because the chain requirement had just been lifted. After that it was smooth sailing until I came to Lookout Mountain, the border between Idaho and Montana. The snow had fallen heavily overnight, and was continuing lightly. I love the look of Pine trees laden heavily with fresh white snows. Burdened by the moisture that sustains them in spring. As the morning dawned, the sky quickly began to clear and turn a fabulous shade of blue, with small billowy clouds. I am always amazed at the depth of color in the Montana skies. Whether it’s a sunrise or a simple clear day the colors are always so very intense. Of course the purity of freshly fallen snow may have added a little to that effect. After a short period, we had to stop for a quick facility break. To give you an idea of the amount of snow that had fallen, I took this picture. It is the entryway to the restrooms. Poor little Peanut was not particularly happy with me in this choice of location. It’s pretty hard for a 3 pound 4 ounce Chihuahua to navigate in deep snow. I find it very comical though, because I always have to clear the snow out for him to walk around. He’s so short, he’d get lost in a minute. Soon, it was time to continue on. Before long we had driven out of the snowy mountains. Entering an area more like South Park where I grew up. Wide open parries surrounded by mountain ranges all around. The coloration of the sky was breathtaking. Light sky blue in the distance, darkening to a deep azure blue right above us. The Montana and Dakota areas are some great places to drive through. It was a nice change after the frequency of runs along I-80 I deal with. I do like the South Central part of Washington, Yakima Co. Area. I feel right at home with the Mountains and Pine Trees. The other day was even more like home, with a steady snowfall and considerable wind. Much more snow was to fall before the day was done. Funny how winter weather conditions in the right setting can be strangely comforting. I suppose it comes from being raised in the mountains of Colorado. Growing up, we had a saying about South Park winters. ”There are nine months of Winter, three months of Fall, a breath of Spring, and no Sumer at all”. I did enjoy the drive, as it allowed me to get off the freeways, and experience a little more closely, the terrain I drove through. Many times I like to hit the side roads and short cuts. So many of them end up taking a little longer because of the slower speed limits, but it is so much more enjoyable. I do love the personality of Mountains. Inspiration comes from many places. To many times I forget just how much I am inspired by the blogs I read. Many are penned by those who read, comment on, or like my own posts. Today I was reminded, simply from reading a post on Living and Loving. The article was about a single old knurled pine tree found amongst many others. Wise Old Pine talks about a sense of spirit the tree seems to have, and how inspirational it is to the author because of its stalwart existence. Reading the story, made me think of those ancient old Bristlecone Pines trees I loved so much, back home. I loved to hike along Windy Ridge above Alma, Co. or High Park, just below the summit of Mount Silverheels above Fairplay, Co. To meander among these ancient trees you couldn’t help but feel they had a spirit all their own. I’m sure if they could talk, the stories told would be phenomenally inspiring. The generations of people they have seen come and go in their lifetime is mind boggling. These trees have know tribes, clans, people of many era’s of our own evolution, and remained to tell the tale. 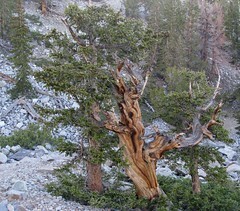 The Bristlecone Pine is the oldest tree known, being aged as much as a millennia, or more. They have stood the test of time and the tortures of wind, and mountain weather. The amazing trees grow in the high country where winds are ferocious. Clinging to cliff faces, mountainsides, and ridgelines. Roots firmly planted, seeming to meekly hold a tempered grip on nothing more than stone. Twisted, knurled, and bent to the whim of nature, they keep hold, never losing their footing. I always felt their main beauty was in the tortured twisting of their grain. You could picture the weathered, leather like hands of an old Indian or Wrinkled face of an ancient woman in the knurled trunks. The wrinkles and twists of time add a sense of intelligence or wisdom, hard earned… highly valued. Just imagine the tales and stories they could tell! Truly, it is sad that they could be finding themselves endangered by something as common as global warming. How long will it be until they are nothing more than Mountain Memories? Bear Lake in Utah is one of the prettiest areas of the state. I recently had a load running from Pennsylvania to Logan Utah. The route took me through Bear Lake and over the Mountains on US 89. This was probably the first time I have been on the road when there was no snow. It is a fairly treacherous run, climbing to 7729 feet, and then corckscrewing its was down through Logan Canyon. It is a narrow winding highway through about 50 miles of beautiful countryside. The roadway runs right alongside a creek, complete with beaver dams and all. Thick pine trees and steep hillside cliffs provide the only boundaries. The route save about 100 miles but takes a little longer. It is one of my favorites because there is a feel of home, there among the Mountains. Unfortunately I didn’t have the time to stop and get some pictures. Maybe next time. The other day, I think it was Saturday but I’m not really sure… My days all run together at times, I was able to drive my beloved mountains. OK, not the Mountains I really want to be in, and but dam close. The I-70 corridor through Colorado and Utah. Of course to get there one must drive the famously, flat, boring, and dam near never ending Kansas / Eastern Colorado corridor. If not for the signs and mile markers one would be blissfully unaware a state boundary had been crossed. The level of my excitement at reaching the Denver city limits was measurable by the cyclic rate of my pulse. Trust me this is a condition of totally unfamiliar sensation for me. Denver has never been one of my favorite cities. 86 miles west south west, and 5,000 feet higher the sensation would be completely understandable. We changed driver’s at the TA Denver West, topped off the tanks, both the trucks and our own. Now I have never been one to let my apprentices drive the Eisenhower Tunnel and Vail Pass the first time over. I much prefer they watch me and see how I do it and what gears I choose for the descents. I’m just a little picky about that for some strange reason…My own survival instincts perhaps. As we ease out of Denver, I was surprised at the lack of traffic. Note to self, if something seems to good to be true…it usually is. I start the long arduous accent of Denver’s infamous Floyd Hill, only to come to a full stop on an 8 percent grade with 76,000 pounds and a little micro four wheeler tucked under my DOT bumper. Note that I leave plenty of distance between myself and the truck in front of me. Unlike cars with automatic transmissions, big trucks can have a tendency to roll back slightly when trying to get started on a serious incline. We ended up sitting there for about 45 minutes before traffic started moving again. I was able to get going without rolling back and crushing aforementioned micro car. What pray tell was the cause of the conundrum you ask? Why the safest car, according to its manufacturer, a Volvo had caught fire, and and now sat smoldering with a collection of fire trucks, ambulances, police cars, and of course the cluster of volunteers vehicles with their wide variety of emergency lights, causing the traffic to merge all the way to the left lane to squeeze by. We continued upward and westward till we came to the Loveland Pass exit. Which I purposely passed. Unlike last year around this time when I had a student I got along with, I decided not to traverse that beautiful pass. I will however share some pictures from last year. Note the sign at the summit gives the elevation as 11,8?? feet above sea level. My student last year, also named Eric, discovered the oxygen deficiency at that elevation when he decided to run full tilt up the hiking trail at the summit. Of course I was quietly cautioning him of this during his wild dash. I guess he couldn’t hear my whispered warning through grinning mouth. Back to this year, and our continued journey west. We succeeded in our climb and decent of Eisenhower Tunnel approach. My apprentice, complaining the whole time that there must be a good better route. I tried to explain that any way around meant a couple hundred miles extra, and therefore additional fuel. Of course he saw nothing wrong with that. Naturally, he’s not paying for the fuel… I am. We still had Vail Pass to go, and I had started wondering why I never invested in hearing protection of some kind. I resorted to an old standby from my previous life that had always served me well. I simply told him you have the right to remain silent…Please exercise it! The remainder of the trip was fabulously peaceful, except perhaps the questioning glare from my silent passenger. As a bonus, and I was privileged to have dinner with my niece and nephew in Dubuque, Co.
A couple of great kids they are.